Many enterprises are moving from batch to streaming data processing. This engineering innovation provides great improvements to many enterprise data pipelines, both on the primary processes such as front-facing services and core operations, as well as on secondary processes such as chain monitoring and operational risk management. Streaming Analytics is the evolution of Big Data, where data throughput (velocity) and low-latency are important business KPIs. In such systems, data signals are ingested and produced at high speed - often in the range of millions of events per seconds. On top of that, the system has still to operate on large volumes of heterogeneous resources, it must execute complex processing to verify the completeness and accuracy of data. Finally, the produced output and data transformation must be produced fast enough to be relevant and actionable. A batch chain is normally a series of transformations which happen sequentially, from source data to final results. Data moves one batch at a time from one step to the next one. Batch systems usually rely on schedulers to trigger the next step(s) in the pipeline, depending on the status of the previous step. It usually introduces unnecessary latency from the moment the initial data is provided to the moment the results are produced. If those produced results were in fact insights, they might lose their "actionable" power because it is already too late to act. Responses and results are delivered after the facts, and the only analysis which can be done is a retrospective analysis, but it's too late to steer or correct the system, or to avoid the incidents in the pipeline. Decisions are made on results from aged or stale data, and they might be incorrect as the result do not reflect any longer the state of the system. This could produce over- and under- steering of the system. Data is at rest. This is not necessarily a drawback, but batch system tend to be passive, with time spent in extracting and loading data from file systems to databases and back with peaks and congestions on the enterprise network rather than a continuous flow of data. From 10'000 feet high, a streaming analytics system can best be described as a queue. This logical, distributed queue connects agents producing data to those consuming data. Many components can functions both as sources and sinks for data streams. By highlighting the queue rather than the processing, we stress the fact that data is flowing, and data processing is always interleaved data transfer. The same data element on the queue can potentially be required by many consumers. The pattern that best describe this is the publisher/subscriber pattern. As the data transiting on the queue can be consumed at different rates, such a queue should also provide a certain persistence, acting as a buffer while producers and consumers are free to access data independently the one from the other. Furthermore, batch processing can be easily implemented on streaming computing architectures, by simply scanning the files or datasets. The opposite is not always possible, because the latency and processing overhead of batch systems is usually not negligible when handling small batches or single events. Next to latency and throughput, another important parameter which defines a streaming analytics system is the granularity of processing. If the system handles streams one event at a time, we define it as an event-based streaming architecture, if the streams gets consumed in packets/groups of events we call it a micro-batching streaming architecture. In fact you could consider a batch pipeline a streaming architecture, albeit a very slow one, handling the streaming data in very large chunks! Enterprise BI processing chains tend to be very complex, because of the volume, but also because of the number of regulations and compliance measures taken. Hence it's not uncommon that process changes and unforeseen load can strain part of the chain, with oftentimes big consequences. When incidents occur several steps if not of the entire chain must be re-run. These incidents are often a source of delays, reduced service level and in general lower quality of internal BI process measures and KPIs. Data values tend to be stable around some statistics, therefore we could collect the logs and build a model complying on the statistics of incidents, and other monitors values in order to determine the chance of success of a given ETL pipeline. Same sort of analysis can be applied to variables such as ETL jobs logs to monitor and process volumes, time of processing, query types . This information can be captured at run-time as the ETL jobs are executing. Here below a few examples of anomaly predictions and time series forecasting on machine logs. Data values tend to be stable around some statistics, therefore we could use this statistics to characterize future data and detect potential incident early on the ETL process. This analysis exploit the nature of data being processed as well as the metadata provided by the ETL tools themselves, to increase the chances of both prediction and detection. Cluster processing based on queries types, query result statuses, access logs, and provide an indication on the "norms" for data and process quality as well as detect possible intrusions and cyber security attacks. ETL metadata, is a rich source of information. Normally this information is manually curated. However metadata is data. And as such it can be processed as text, text extraction techniques can be applied to db logs, query logs and access logs. Once the data is being structured, machine learning and data science techniques can be applied to detect clusters, and (semi) automatically classifying datasets, providing higher SLA, better data quality, and higher prevention of both incidents as well as cybersec attacks. Streaming data is still data. Hence, it must be managed and governed. One way of managing data is by logically partitioning it in semantic layers, from raw data sources to actionable output. In particular, Streaming data can also be layered: from raw events to alerts and notifications. If we consider the streaming components as a stack, we can select for each component a number of tools available in the market. Therefore, we can define a number of bundles or recipes depending on the technology used for each component of the stack. In the diagram below you can see a fee of those streaming analytics bundles. Some of those bundles are composed of open source projects, others by proprietary closed-source technologies. This first classification positions technologies such as Splunk, HP, and Teradata, SQLStream in one group and the SMACK, ELK, Flink stacks in another. Moreover, some bundles are fully delivered and maintained by a single company (Splunk, HP Arcsight, Elastic) while others bundles are composed by tools maintained by different companies and dev centers (Teradata, Flink, SMACK). Also, considering the streaming analytics use cases, some of this bundles are better tuned to specific domains (cyber security, marketing, operational excellence, infrastructural monitoring) while others are more less specialized and can be tuned or customized to a specific set of use cases. While the following diagram is not exhaustive, it provides a selection of some of the most bespoken and widely adopted components from streaming analytics as available today in the market. The following scorecard can be used to determine which individual components and which bundles are more appropriate and fit-for-purpose provided the use cases, the organization, the capabilities both in terms of people, tools, and technology, the business and financial goals and constraints, and the culture of the given enterprise. Open Source Sharing the source code, provides a higher level of transparency. Ease of Use How easy it is to implement new use cases? Or to modify existing ones? because of the level of tuning and customization and create technologies lock-ins. Documentation Is the tool well documented? What about, Install, configuration, and examples? process and provides feedback on features, bugs and best practices. market provides an indication of the maturity of the solution. Libraries Are Plugins and 3rd Party Libraries available? Performance How fast are streams processed? How efficient is the solution provided the same amount of IT resources? Release cycle How often are new releases delivered? TCO What is the estimated total cost of ownership for the selected cpmponents? Data Integration Can the available data sources be directly used? What about data models and formats? Expertise Are experts available in the job market? Can they be easily acquired? Data Volumes How well can the selected technology cope with the data volumes generated? the technology join and merge data? security and auditing measures setup in the enterprise? 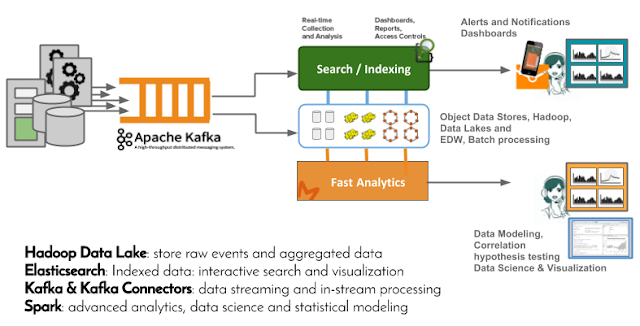 From a logical architecture perspective, streaming analytics processing can be seen as data transformations or computing step which fetch data from a distributed queue and push results back to the queue, as previously explained on the log-centric conceptual diagram of streaming computing. Before diving in the detailed in the architectural blueprint, let us analyze the main components of such a system. The diagram here below provides a simplified description of the different parts constituting a streaming analytics architecture. 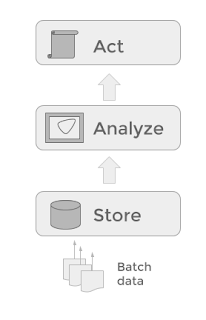 Starting from the bottom, we define two storage layers, the top two layers are analytics, and visualization. The first is a typical a Big Data layer for long term storage of data. It provides an excellent and cost efficient solution to store raw stream events and meta-data. Data on this layer is most efficiently stored in large files. This layer is usually not great for random access of specific records, but works well to stream out large files and have them processed in engines such as Presto, Hive, and Spark. The second storage layer is more tailored toward objects and documents. The characteristic of this layer is that access is fast. This form of storage provides better data search and exploration functions. Moreover, a document store provides fast searches by indexing textual data, and fast access to individual stream events/elements. This layer is typically realized using NoSQL technologies, out of which two of them Cassandra, and Elasticsearch, are discussed in better details in the following sections. The third layer is meant for model building and data exploration. Presto and Hive are SQL engines part of the Hadoop ecosystem and they are tuned respectively for interactive exploratory queries and large batch analysis on big data volumes. Spark is also an interesting components as it allows to interleave Machine Learning operations with both SQL queries and data transformations using languages such as Scala and Python. The top layer is populated by data visualization tools. These tools usually access the underlying analytical layer in order to perform the computations, and then display the results using dashboards, graphs and widgets, often via a Web UX. The following architectural blueprint, provides a possible implementation for meta-data managements and chain monitoring. It consists of three main parts. Model creation and model validation using data science and machine learning tools. The above blueprint architecture is a possible end state for chain monitoring and operational excellence. It can definitely be phased in stages according to the organization's appetite, roadmap and strategy to streaming analytics and real-time data processing. One general remark is that each streaming technology and each component of the above blueprint has its "sweet spot" in the overall data landscape. Elasticsearch is extremely efficient at storing, capturing and display time series data. However because of the way the data is structured complex queries and joins are usually not performed efficiently within this platform. This is way for complex query Elasticsearch can be complemented by other solutions such as Spark, Presto, Hive, Cassandra or other analytical systems such as enterprise data warehouses to act as "powerhouse" for complex queries and aggregation. The proposed combination of file and object data stores, topped by Spark is quite powerful and provided probably the highest level of flexibility in order to implement each specific use case, in a tailored and customized way. Spark uniqueness comes from the fact that it provides a unified data programming paradigm. 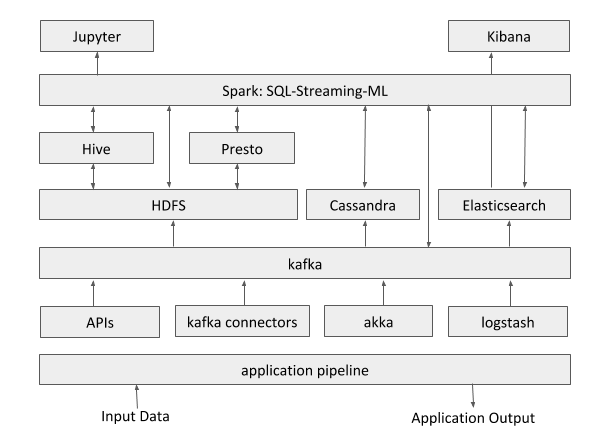 Spark combines SQL, Python, Scala, Java, R, as well as streaming and machine learning capabilities under the same programming paradigm, and using the very same engine to perform this variety of computations. The suggested blueprint requires of course further analysis and it's advised to determine which scoring criteria should weigh more in the selection and determine which components or bundles in the architecture should be prioritized. It's also probably wise, seen the vast choice of components, tools, libraries and solutions to identify which level of integration (libraries or ready made packaged solutions) is preferred in the organization. Depending on the availability of devops resources, you can trade flexibility, and customized solution for pre-canned use-case specific solutions. Active human-manned monitoring is becoming unfeasible, especially when hundreds of dashboards are produced by systems such as Kibana. It's therefore highly recommended to complement the dashboarding approach to a more data-driven solution where patterns and anomalies are learned and detected autonomously by the system.